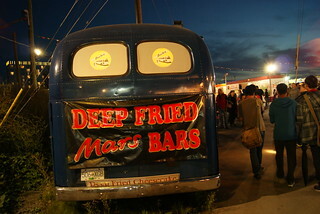 I had a real culture shock a couple of weeks ago when we went to the Richmond Night Market and I saw a food cart offering… deep fried Mars bars! Really, fried a chocolate bar in hot oil is one of the most unhealthy things that I can imagine. So I decided to investigate a little about this strange custom… The dish is said to have been invented in 1995 in the Haven Chip Bar in Scotland. The recipe consists in cover a Mars with a batter commonly used for frying other kind of food like fish or meat. The trick is to chill the bar before fry it, because if not the chocolate can be melted into the frying fat. Yummy. But this isn’t the only deep-fried thing that you can find! Basically, you can find any chocolate bar brand like Snickers or Twixs. 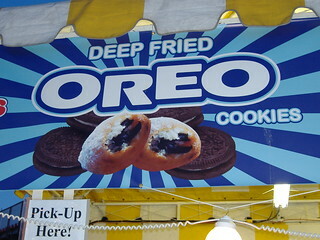 But you can find a big variety of deep-fried foods… like deep fried Twinkies, deep fried Oreos, deep fried ice-cream and even deep fried pizza! I don’t know you guys but I really want to try something of this, only for the experience, but I don’t know if I will be able of try that… What do you think? A recently studio says that Canada is the 6th happiest country in the world (the first one is Denmark, if you feel curious). The study, supported by the United Nations, contemplates many factors like life expectancy, GDP per capita, social support, generosity of fellow citizens, state of the economy, perceptions of corruption and freedom to make life choices. This result doesn’t surprise me at all. Everybody has a smile here, everybody is polite and nice. Even the police. “We are obligated to ask for two pieces of ID to all the people under 30. So don’t be angry with the employees if they ask you for your documents, it’s a compliment”. After a while, is logical to realize that if they are so nice, is because they feel happy. So, I decided to make a sociological investigation about the factors that explain why the Canadians are so happy. – Obviously, one of the main reasons is that Canada is a rich country. They have a good economy, it’s easy to get a job and there are a lot of resources for a small population. – The social cover is pretty good here, other reason to feel safe. Have universal health care and public education is one of the foundations of a happy society. This is one the biggest differences when you compare Canada with USA. – Equality and tolerance. It’s also a country where the differences between the social classes are not very big, and other cultures are usually welcomed. I repeat, in general, it’s impossible to extend one opinion over a whole country. There are stupid people everywhere. So up to now, we can find these factors in others countries with a good position into the ranking. But, what factors are exclusively Canadians, what makes Canada so especial, what is impossible to find in other place? – The amazing nature. With all this beautiful landscapes around you is impossible to feel bad. And practicing outdoor activities, be in contact with the nature, is very easy even if you live in a big city. – Hippie culture heritage: maybe is my impression, but I think that some concepts of the 60’s hippie culture are still present in the global values of the Canadian society. Apart of be nice and take care of the environment, there are other things. For example, be easy-going is almost a must here, at least into the young community. And is very common to hear expressions like “good o bad vibrations” or “harmony” and they have a strong sense about being a community. – Avoid the critics or negatives comments are another very common features inside the Canadian society. This behavior sometimes drives the Europeans crazy, because is impossible to know if they really think that you are so amazing or they really hate you. – Freedom: in my opinion the social codes are more relaxed here. For example, the other day I went to a hospital and my nurse was completely full of tattoos and she had green hair, which is completely impossible to find is Spain. Anyway, this is only a personal opinion. If you want, you can share with us you more shocking experiences with the Canadian way of life. I arrived here (almost) two months ago, and I still confused about tipping. We’ve talked about this “culture shock” in the past, but more about how shocking is for us. So this post is for all that people who still feel fear when the person behind the counter is smiling while you take your wallet. – As you know, tips (or gratuity) are not included in the bill. – You have to tip between the 10% and 20% of the bill (without taxes). Normally is 15%. – If you still have problems to calculate the exactly amount, remember: (the bill x 15/100). I know that a lot of people are going to say, “Oh, come on, everybody knows that”. But, not. Believe me. – If you pay with credit card, you have to put how much do you want to tip, or the employee will do it by himself. 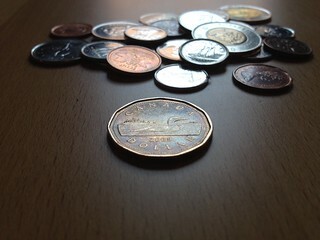 – In restaurants and bars, if you are a big group (usually 8 people or more) the tip is included in the bill. – In a pub or restaurant, there used to be a waiter or waitress (most of the times) in charge of your table. You always have to order to the same waitress. – Sometimes, the waitress can give you the bill each time that you order. This is maybe because she’s afraid that you leave without pay (specially in a big group). And yes, you have to tip every time. Why do you have to tip? The salary of waiters is a little lower than the rest, so they always apply for the job with the tips in mind. Where we have to tip? Restaurants and pubs, taxis,hairdressers, beauticians. Where we don’t have to tip? Restaurants like McDonalds or Tim Hortons. What happens if I decide to don’t tip? Watch your food and better don’t come back.